Mark O’Sullivan’s 58th minute header was the difference between the sides at Turner’s Cross. 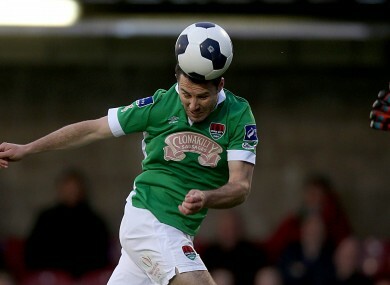 File photo of a Mark O'Suillivan header. MARK O’SULLIVAN’S 58th-minute goal helped Cork City to keep pace with league leaders Dundalk as they overcame Athlone Town at Turner’s Cross tonight. It was far from easy for the home side, especially in the first half, when massed Athlone ranks made it difficult for City to create any sort of an opening. Apart from Garry Buckley’s header back off the crossbar from John Dunleavy’s cross in the 45th minute, goalmouth incidents were rare to the point of extinction, but an astute tactical switch by manager John Caufield at half-time paid rich dividends. Bringing on Rob Lehane for Liam Kearney, Caulfield switched to 4-4-2 and immediately there was a more threatening look to Cork, with Lehane (twice) and Gearoid Morrissey having efforts before the breakthrough came. O’Sullivan got the goal and it was a fantastic effort, as the striker judged his header to perfection from Brian Lenihan’s lofted pass, looping the ball over Athlone goalkeeper Paul Skinner, who had strayed only yards from his line. The goal completely changed the game’s dynamic, with Athlone now forced forward, allowing City space to exploit. O’Sullivan and Lehane both came close to adding a second goal, denied by Skinner and defender Barry Clancy respectively. They did have to be wary at the other end too, however, as Mark McNulty made a good save from Athlone sub Ian Sweeney. While Athlone suffered the loss of captain Alan Byrne to a second booking late on, they did have one last chance to equalise as Declan Brennan’s backheel from a cross beat McNulty but Dunleavy cleared and Cork held out. CORK CITY: McNulty; Dunleavy, Murray, D Dennehy; Davoren (Kavanagh 90); G Morrissey, Healy (O’Leary 74); Lenihan, Buckley, Kearney (Lehane half-time); O’Sullivan. ATHLONE TOWN: Skinner; Quigley, Byrne, Brennan, Clancy; Dillon, Hughes; Brennan, Rusk (Harney 86), Marks (Sweeney 64); Gorman. Email “No sign of Kimye, but Cork do enough to keep up challenge with win over Athlone”. Feedback on “No sign of Kimye, but Cork do enough to keep up challenge with win over Athlone”.